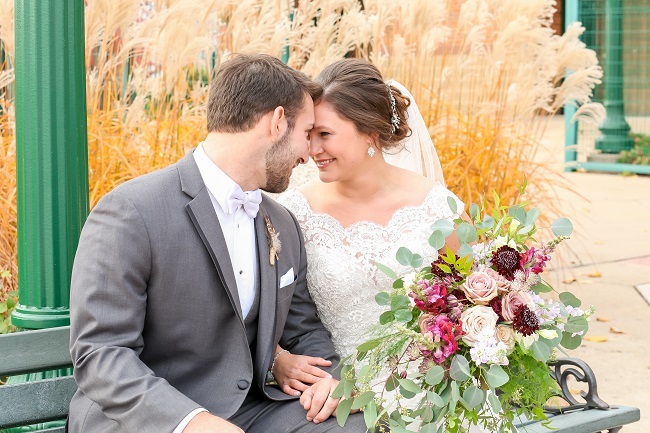 Lucas and Lauren were married last November 3rd which turned out to be a gorgeous fall day! 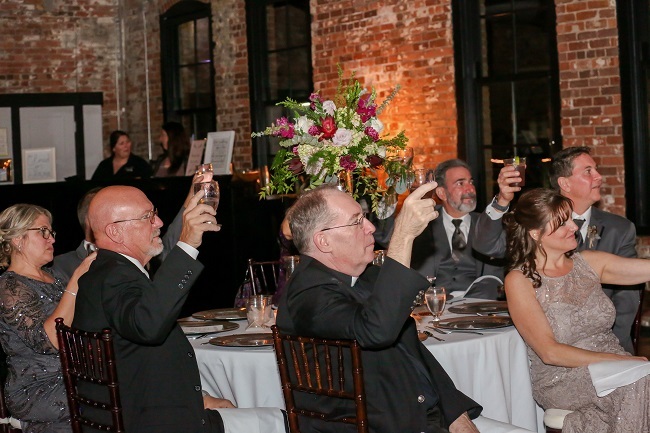 Kinard Photography documented their day with images taken along the Peoria riverfront, at the gorgeous Cathedral of St. Mary where the ceremony took place and the historic Trailside Event Center where the reception was held. Luc and Lauren met the summer after their high-school freshman year at a local waterpark where they were both working, but it took two summers of incredibly sophisticated teenage flirting before Luc asked Lauren out. He took her to a game of put-put golf and later for ice-cream. They found that their competitive natures were well matched – You would think that he would have let her win – Nope!! Luc had planned to propose to Lauren on Christmas Eve when his whole family stops by before mass to take a photo in front of the Christmas tree. 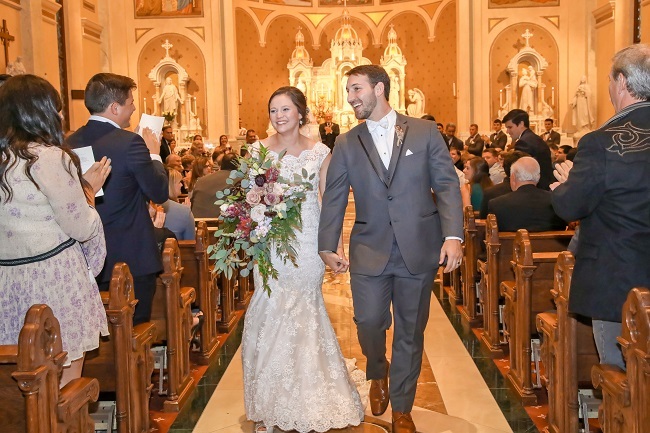 He invited Lauren to come early and gave her explicit instructions to come in through the garage where she would walk into the family room and find him down on one knee with his I-phone set up in place to video the big event! Lauren arrived with an armful of gifts and wasn’t able to get the garage door open so she went to the front door and rang the doorbell. A flustered Luc answered the door and led her to the family room to where he thought the spot was for the camera to capture the proposal. The proposal went off fine, but later when they watched the video, the placement was off and Luc’s head blocked the whole event. His family came downstairs and they all celebrated the happy event with champagne!! 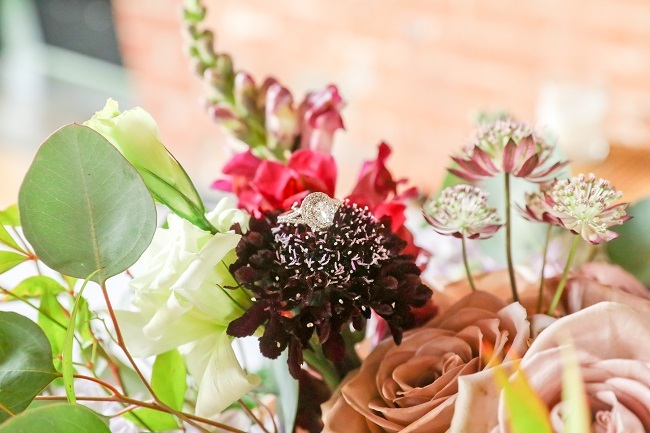 Lucas and Lauren were living on the east coast so we did the planning for their wedding flowers through “go to meeting” chats and exchanging photos by email. 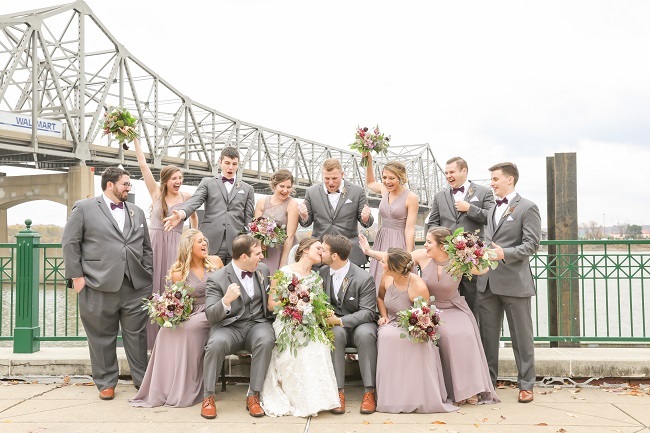 As soon as we saw a sample of the bridesmaid dress fabric, we knew that the Amnesia rose’s lovely vintage lavender color would be the perfect shade. 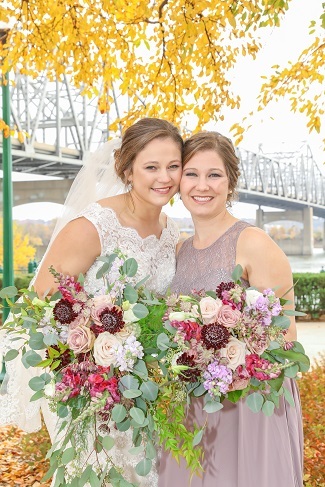 Lauren wanted lush, organic bouquets with a lot of cascading greens. 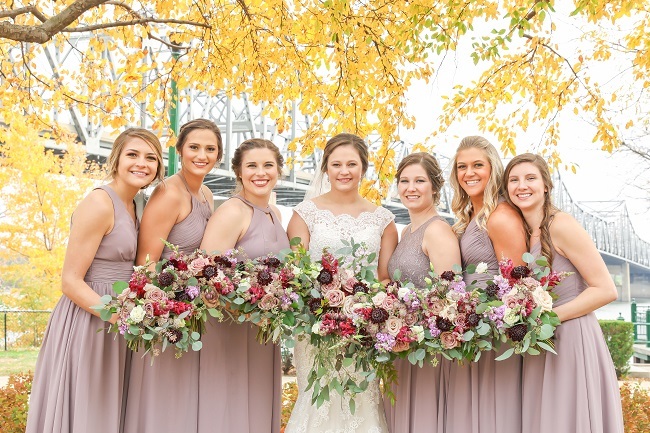 We used silver $ and seeded eucalyptus along with nandina which is kissed with a bronze/burgundy cast in the fall and was a perfect complement to the purple astrantia and burgundy scabiosa blooms. 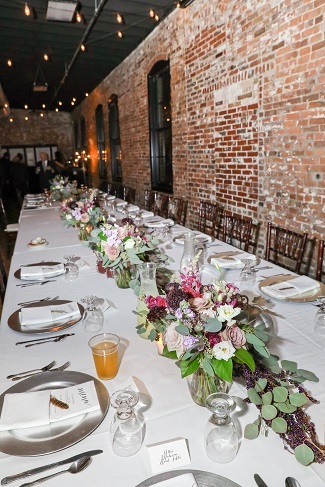 The beautiful mauve Quicksand rose and the lavender & magenta shades of stock flower rounded out the bridal bouquets, and table centerpiece arrangements that Luc and Lauren loved! 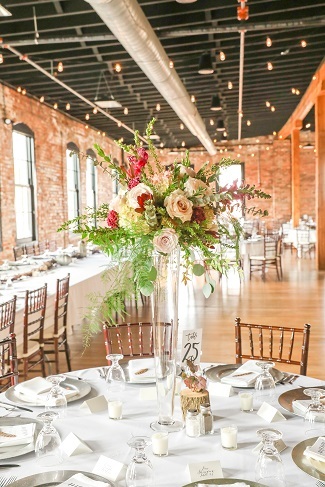 Lauren found that the most difficult aspect of planning their wedding was staying in budget. She had big dreams, thanks to Pinterest but quickly realized when they started adding everything up they needed to prioritize. They each sat down and made a list of what the five most important things were to each of them. Thankfully their lists mostly matched and that is where the majority of their budget was spent. They enjoyed the cake testing the most of all the wedding planning! 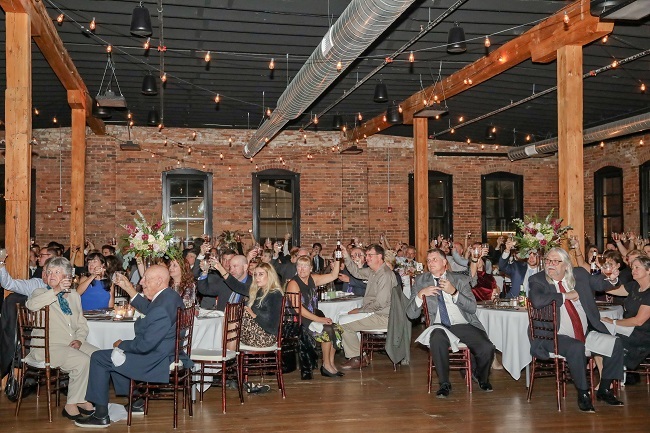 Trafzger’s Bakery was chosen to bake the cake and is located on the bottom floor of Trailside Event Center. 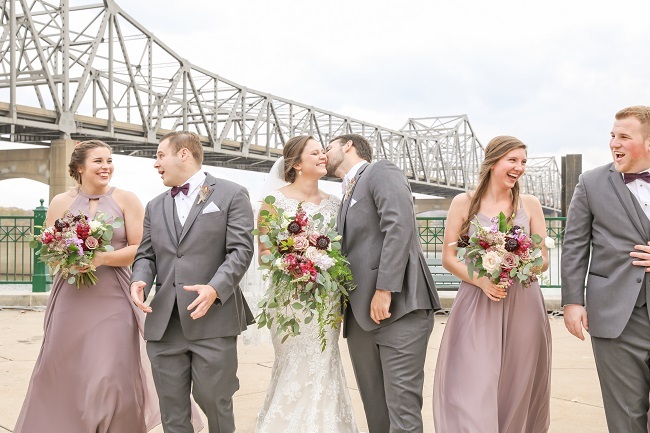 Luc and Lauren have so many fond memories of their special day that it’s hard for them to pinpoint just one, but remembering their first look stands out in their minds! 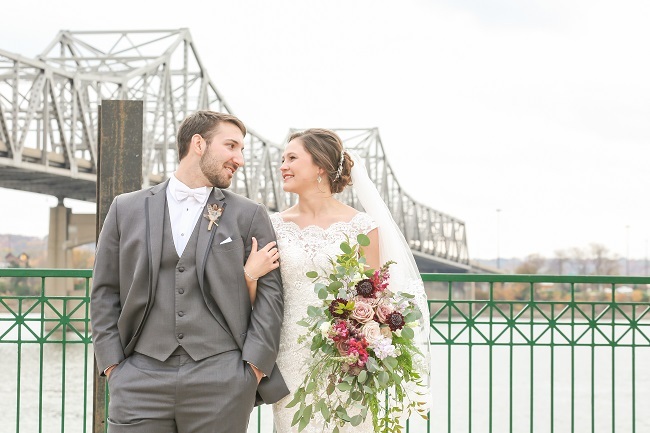 Luc was facing the river at The Gateway Building and Lauren was walking slowly in her high heels toward him when it hit her and she started crying thinking of how lucky she was to get to spend her life with him. As she reached him and he turned around, she will never forget the look he gave her in that moment…that memory will stay with her for the rest of her life. 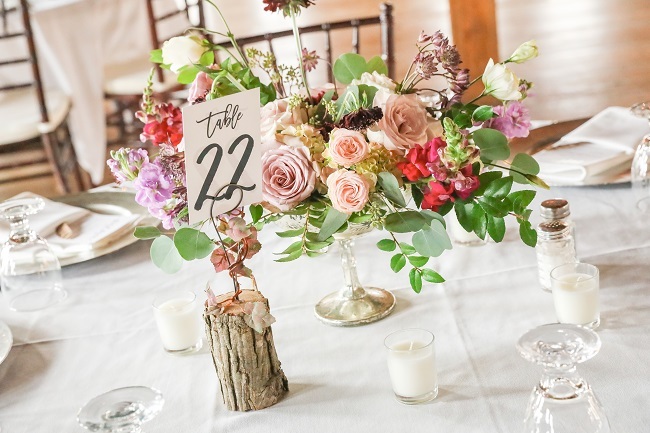 Here is their advice to couples just planning their weddings: The priority list is the key! Figure out what is most important to you – it will make budgeting decisions so much easier. She would tell future brides this: Don’t sweat the small stuff – at the end of the day you will be married to your best friend and this day will be magical! Don’t let the color of napkins or chair choices bog you down. Over the years we have heard so many brides give this advice – Don’t sweat the small stuff!! It must be true so relax and enjoy this special time!! 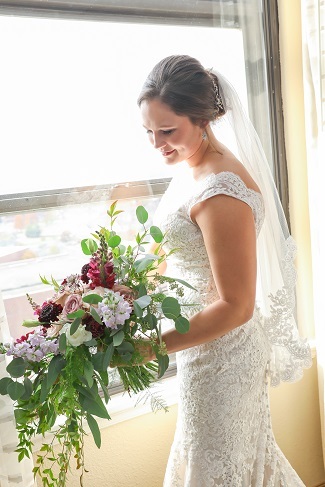 Are you recently engaged and have decided that having beautiful flowers is on your priority list? Call, text 309-212-6570 or email us fancyfloralsbynancy@hotmail.com Beautiful flowers are our specialty!! !